One of the many famous sites for various paranormal activities is the tunnel. This underground passageway which often served as an alternative route for local traffic has also developed a reputation for being one of the most haunted sites on the road. One such example is the Senesbaugh Tunnel that sits at the foothills of East Tennessee. 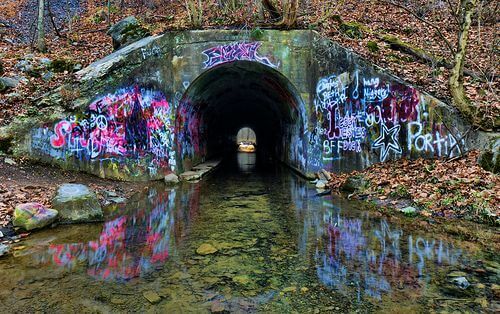 Located off the Big Elm Road in Kingsport, Tennessee, the tunnel was believed to have been constructed during the 1920’s but now sits in disrepair with several graffiti spread across the face of its walls. It is believed that the haunted nature of tunnel is accredited to the the tunnel being the site of grizzly murders, death, and even satanic rituals. Locals who live int he nearby tunnel has warned visitors from venturing into the said structure. It has been reported that the tunnel has become the site where demonic apparitions appear, where car engines die out of the blue and where the eerie shrieks of trapped women and babies would echo. The said tunnel was named after the land owner upon which it was built named Edward Sensabaugh. There are several versions of how this man is portrayed in several local stories but this has been credited to be one of the reasons that started the hauntings in the particular site. The famous story surrounding this infamous tunnel started when Ed had welcomed his home to a homeless man as an act of charity. Their homeless guest attempted to steal jewelry so naturally, the host confronted him with a gun. The thief in defense, took his baby daughter out of the house and drowned it in the tunnel. Another version of the story pictures Ed as a madman murdering his entire family before drowning the baby in the tunnel. It is said that the baby is one of the most famous figures haunting the tunnel to this day. Ed eventually lived until his old age until the 1950’s and by then the tunnel have fallen to disrepair. It is said that to scare vandals in the tunnel Ed would hide at the end and mimic animal sounds to scare the trespassers away. It is said that even decades after his death, Old Ed can still be heard roaming around the tunnels. Locals say that one can hear his footsteps or even his voice across the length of the tunnel in the form of animal sounds. Often times, as locals say, one would even see Mr. Sensabaugh coming up to you in the dark! Another prominent ghost story that is quite famous surrounding this notorious tunnel is the baby that is said to haunt it. This baby is said to be the young, baby daughter of Old Ed Sensabaugh. Locals have a variety of stories to share about this famous haunting is that a baby’s cry would be heard when one drives their car inside the tunnel. When one hears the cry one is advised to cut off the ignition as the ignition does not start once it the tunnel. “I’ve been to this tunnel several times. I’ve been to both the walk through and the drive through. I was told that the walk through tunnel was the actual Sensabaugh tunnel and that the one that you drive through is called the Click tunnel. Both of which I’ve been told are haunted and I believe it. One night that stands out more than any night as far as the Sensabaugh tunnel goes, is the night I was grabbed by the ankle from something mysterious. I went with a group of friends and wasn’t really in the mood to be there so I was just messing around with everyone by trying to scare them. After a while they caught on and I got bored. The tunnel was full of water so I took my shoes off and started walking through the water that ran through. I found a large rock and sat down waiting for everyone else to get bored so we could leave and the next thing I know, I feel something around my ankle. I screamed and ran out of the water and told everyone something had grabbed my ankle. Nobody believed me until I showed them a faint hand print. I don’t know who, or what it was and I’m not really sure I want to know.Every time I go to one of the tunnels something happens. I have picture of someone standing at the end of the Sensabaugh tunnel and I have pictures of a face and some orbs in the Click tunnel. I have also heard a lot of strange things. In the Sensabaugh tunnel, I’ve heard a man talking but there’s no one there. I’ve also heard footsteps through the water and no one is there. In the Click tunnel I’ve seen a woman walking at the end holding something that looks like a baby. I’ve seen her several times and so have the people I’ve went with. I’ve experienced my car shaking back and forth. I’ve seen hand prints on my car and I’ve also had things hit the top of my car and the sound of fingernails going down my car windows. Dimensions: length: 348.0 ft. width: 18.0 ft. 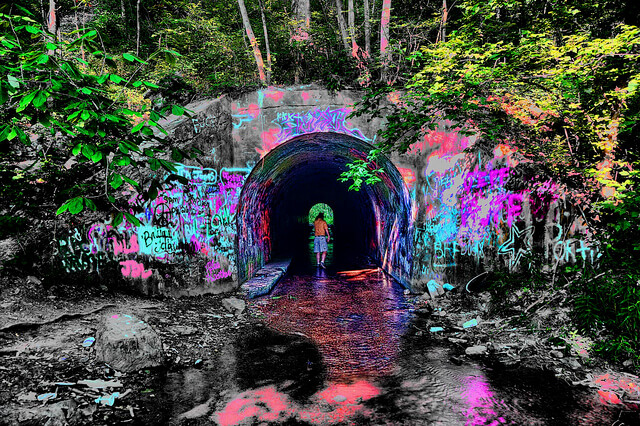 Explore the dark secrets that this tunnel is hiding and dare to enter it.